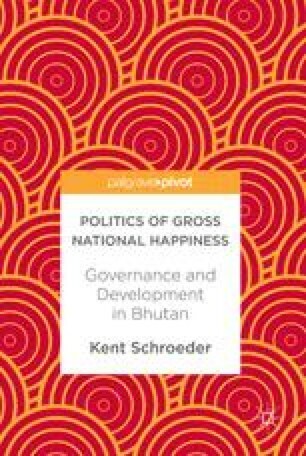 The nature of governance in Bhutan is explored in this chapter as it relates to the process of Gross National Happiness (GNH) policy implementation. This chapter analyses the characteristics of the GNH governance framework intended to frame the implementation process including an expanded set of governance actors and GNH-specific structures and policy tools. This chapter examines the potentially competing interests that characterize the expanded set of governance actors and the intended role of the GNH structures and policy tools in harmonizing these interests. In doing so, it sets the stage for the subsequent chapters that analyse the role of the GNH governance framework in the actual implementation of four GNH policies. Centre for Bhutan Studies. (n.d.). GNH policy and project screening tools. Centre for Bhutan Studies. http://www.grossnationalhappiness.com/gnh-policy-and-project-screening-tools/. Accessed 31 Mar 2017. GNH Commission. (2016). Twelfth five year plan guideline. GNH Commission. http://www.gnhc.gov.bt. Accessed 2 Apr 2017.